ST. PAUL, Minnesota, boasts a new night club said to be without equal anywhere in the world for novelty and comfort during torrid summer months. Called the “Mystic Caverns,” the club occupies a labyrinth of caves which form a natural refrigerator with a year round temperature of 48 degrees. The subterranean chambers where the revelers disport themselves have their opening in the face of a towering sandstone cliff bordering the Mississippi. Once you step inside you are literally in the bowels of the earth, with solid sandstone walls all around you and 150 feet of solid sandrock overhead. About eight degrees of heat make the atmosphere decidedly comfortable inside the caverns when the mercury is flirting with the hundred mark outdoors. 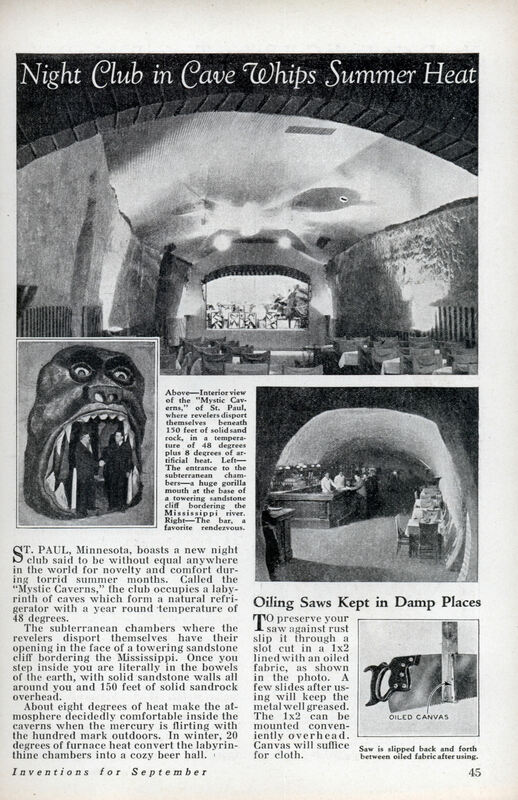 In winter, 20 degrees of furnace heat convert the labyrinthine chambers into a cozy beer hall.